Home > Used Vehicles > 2017 GMC Terrain SLE-2,AWD,AIR,TILT,CRUISE,PW,PL,ALUMINUM WHEELS,CARPROOF CLEAN!!! 2017 GMC Terrain SLE-2,AWD,AIR,TILT,CRUISE,PW,PL,ALUMINUM WHEELS,CARPROOF CLEAN!!! Hurry on this one! Marked down from $25900 - you save $1969. 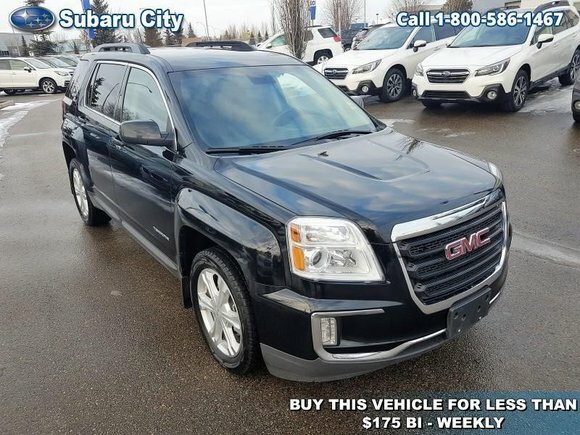 This 2017 GMC Terrain is for sale today in Edmonton. Utility is only one part of this small SUV's story. Every detail and innovation in this 2017 GMC Terrain has a purpose - to give you a superior experience no matter what seat you're in. This compact SUV is inviting and comfortable thanks to its MultiFlex rear seat system that maximizes the rear leg room and utility. Every Terrain is built with precision and distinguishing features, which is a true testament to the craftsmanship and detail that goes into every Professional Grade GMC vehicle. This SUV has 52839 kms. It's onyx black in colour and is completely accident free based on the CARFAX Report. It has an automatic transmission and is powered by a 2.4L I4 16V GDI DOHC engine. This vehicle has been upgraded with the following features: Heated Seats, Power Seat, Remote Engine Start, Premium Audio System, Rear View Camera, A/c, Remote Keyless Entry. It has some remaining factory warranty for added peace of mind. Buy this vehicle now for the lowest bi-weekly payment of $157.29 with $2596 down for 84 months @ 5.99% APR O.A.C. ( taxes included, $790 Administration and Secure Ride included / Total cost of borrowing $5265 ). See dealer for details. Want to try the 2017 GMC Terrain SLE-2?